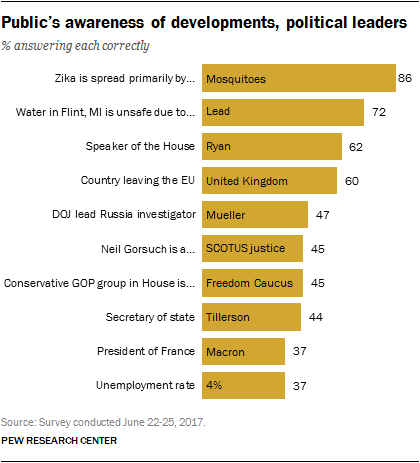 The latest Pew Research Center News IQ quiz finds that many Americans struggle when it comes to identifying some major political figures, though a majority knows that Paul Ryan is speaker of the House of Representatives. On the other hand, there is broad awareness of details related to how the Zika virus is spread (86% know it is primarily spread by mosquitoes). In addition, 72% know that tap water in Flint, Michigan, is unsafe because it contains too much lead. About half (47%) identify Robert Mueller as the person leading the Justice Department’s investigation into Russian involvement in the 2016 election, while 44% know that the current secretary of state is Rex Tillerson. Public knowledge of international developments varies. Six-in-ten (60%) identify the United Kingdom as the country that has officially begun the process of leaving the European Union. However, just 37% identify Emmanuel Macron as president of France (the survey was conducted before President Donald Trump’s visit to France). The new survey, conducted June 22-25 among 1,002 adults, finds substantial age differences in knowledge about several Washington figures. For instance, a majority of those 50 and older (56%) know that Tillerson is secretary of state, compared with 32% of those younger than 50. 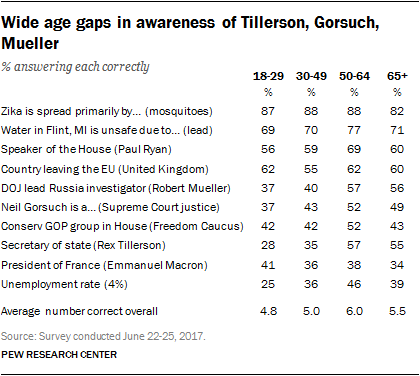 Older adults also are more likely to know that Gorsuch is a Supreme Court justice, and that Mueller is leading the investigation into Russia’s involvement in the presidential campaign. However, majorities across age categories correctly identify Ryan as House speaker. There are no significant age differences in awareness of the United Kingdom as the country taking steps to leave the EU or in the share who correctly identify Macron as president of France. And large majorities, regardless of age, are able to correctly state that mosquitoes are the primary way the Zika virus is spread to humans and to identify lead as the reason the tap water in Flint, Michigan, is unsafe. 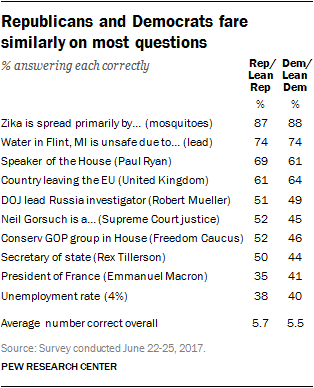 There is little difference in news knowledge across partisan groups, with Republicans and Republican-leaning independents and Democrats and Democratic leaners answering about the same number of questions correctly on average (5.7 questions vs. 5.5 questions, respectively). Republicans are somewhat more likely than Democrats to correctly identify Paul Ryan as the speaker of the House (69% vs. 61%). There are only modest partisan differences on other questions in the survey. As in past surveys, college graduates perform better than those with less education on the News IQ quiz. Those with a bachelor’s degree or more education answer an average of 6.9 questions correctly, compared to 5.2 correct answers from those with some college experience and 4.3 from those with no more than a high school diploma. 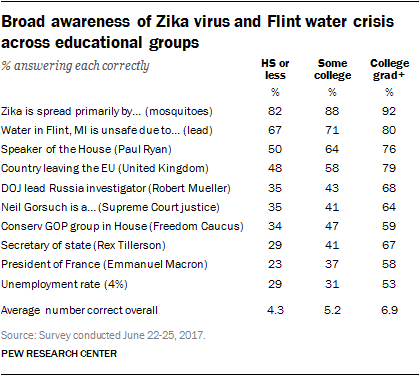 The educational divide is evident across all of the questions asked, but majorities regardless of educational attainment are able to correctly answer that the Zika virus is spread primarily by mosquitoes and that the tap water in Flint, Michigan, is unsafe due to lead. News IQ Quiz: Do you know more about current events than the average American?